I miss you! I miss you every single day. Life without you seems less full, but I am adjusting and I am learning to be a stronger woman every single day. You would be so proud of me. I wish I could hear the pride in your voice for all the things I am working on in my life, and my new-found love of writing… if only I could share my little short stories with you. You had so many amazing gifts. I always told people I am a creative, I just have not yet found my outlet. Well, Daddy, now I know I have; it’s writing. And to think, I did not know of my gift to write until after you were gone, because God moved me to write a speech for your memorial service. I know you were there, sitting in that only empty chair between your Southern family and your West Coast family, center stage to the lectern. We all felt you. I know you know the words I spoke on that day and I wonder could you also hear my thoughts in my mind? I know God and Jesus can hear words and feelings; desires unspoken, but can our lost loved ones hear them too? On the drive to the service I told Dianne that I was nervous. I had never been able to speak in front of a group and I was concerned, because of cultural differences between the South and the West Coast that some of my thoughts might not go over well, perhaps they might even offend people, I had no idea. She seemed suddenly alarmed by my comment but calmly asked me, “Well, do you think you wrote anything offensive” — or something of that nature. I spoke from my heart and told her that from my perspective, of course, I had not. She seemed to relax and assured me that I should not worry about it then, it would be fine. But of course, being me – the old, insecure me – when my turn to speak arrived and I stepped to the lectern I was flooded with nervous energy. As I said, talking in front of a group of people, especially a huge group of people, was really scary and for an instant that fear of offending popped in, though I was able to push it back down. I was there to do what I had to do. Period. I had written my speech, printed it out and highlighted the areas I wanted to emphasize in yellow and the places I wanted to look up and make eye contact in green — that was a huge help! However about midway through I became extremely uncomfortable because the entire time I spoke not a single person shifted in their chair, not one. There were no isolated coughs, shuffling of the feat or giggles from the children. Just dead silence. And Dianne, well she never made eye contact with me though I tried so many times. I did my best to push on through, hoping no one could tell that I was feeling frightened and vulnerable to alienation or perhaps even hatred. It is funny how our minds try to destroy some of us. When I was done I quietly returned to my seat. When the service was over, Daddy, you know what happened, people came to me, strangers mostly, hugged me with tears in their eyes, telling me what a wonderfully moving speech I had made. I remember one person I spoke with, a stranger to me, I confessed my unease because the room was so silent throughout my words. She said, “Oh, no, Memee, it wasn’t that at all. Your words were so moving, so sincere and your love flowed through that we were on the edge of our seats, unable to move, hanging on your every word.” Others wanted to comfort me and others told me that my ideas and thoughts were true. Daddy, you couldn’t hear a pin drop, and that was GOOD. I thought it was bad, but it was GOOD. And then after the service, those 40 or so people who had decided to come back to the house, well, they approached me too, this time your close friends and of course family members. All told me how moved they were by my words and gave me positive feedback about my skill of writing, that I should keep at it and one person even told me I should join Toastmasters because I was a great speaker! Me!! 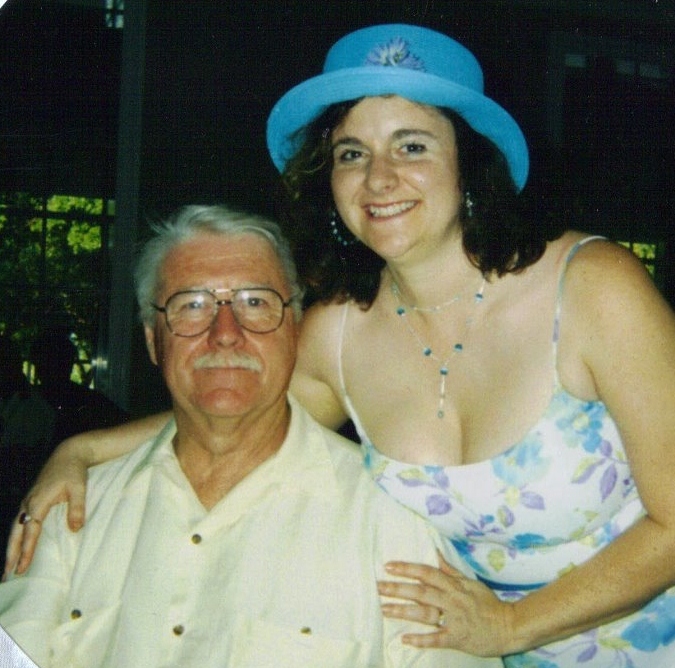 Anyway, Father’s Day is here and I want others to know how incredible you were and I want to honor your life again as I did on that sad day last September… and of course, selfishly – or maybe it isn’t selfish at all – I want to be sure that my Eulogy to you is in a safe place. Safe from destruction from fire, water, computer crashes, children, pets or even just lost over time and so I am sharing it here on my corner of the web. I love you so very much and have to remind myself every day that you are no longer here to walk with me, but sometimes I do feel you and know you’ve joined me for a few quiet moments together. It’s not as fulfilling but it helps me to feel not so alone.